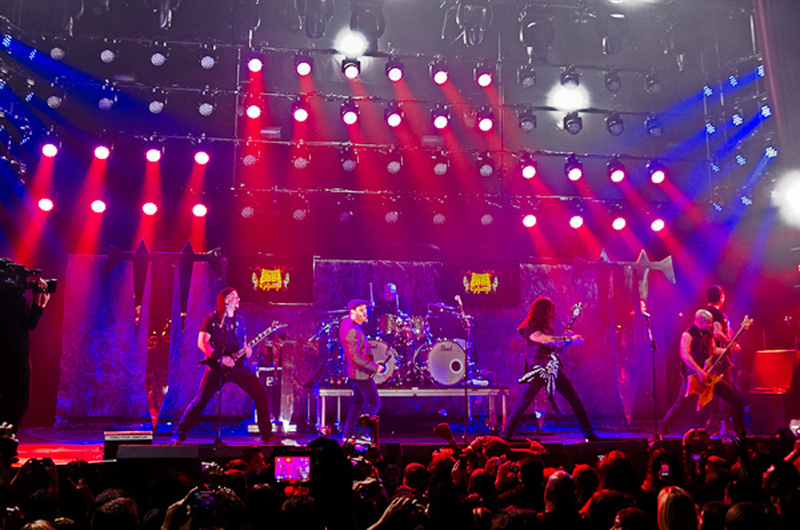 Lighting designer Lee Rose was again called on to light America’s premiere heavy metal awards, Golden Gods, and again turned to a cutting-edge Martin Professional luminaire to fulfill the brief, this time in the form of the MAC Aura. This was Lee’s third year lighting the awards show with this year’s edition taking place at Club Nokia in Los Angeles. Lee has previous experience using the Aura, namely on 2011’s “New Year’s Rockin’ Eve” show, but for Golden Gods his motivation was to see how they looked in a large array. Lee used the Aura to create a heavy metal style “wall of light” as a backing / scenic look to the turntable stage by placing four rows of fixtures in a matrix over a divider wall. Lee names the Aura’s homogeneous color output, tight beam, power, small size and ability to overlay color on the backing glass as exceptional features. The rig also incorporated Martin MAC 101™ LED wash lights and Atomic 3000™ strobes, all supplied by Felix Lighting. Streamed live to Xbox and Facebook, Golden Gods was broadcast to television audiences on VH1 on May 28th. Produced by Alan Newman, Stage Presence, Inc.